The landing page of SLOBS’ new App Store. MonsterCat music with zero DMCA risk. HueLightBot with the chance to allow chat to control the lighting in your room. OvrStream’s 3D alerts to add variety to a usually 2D experience. 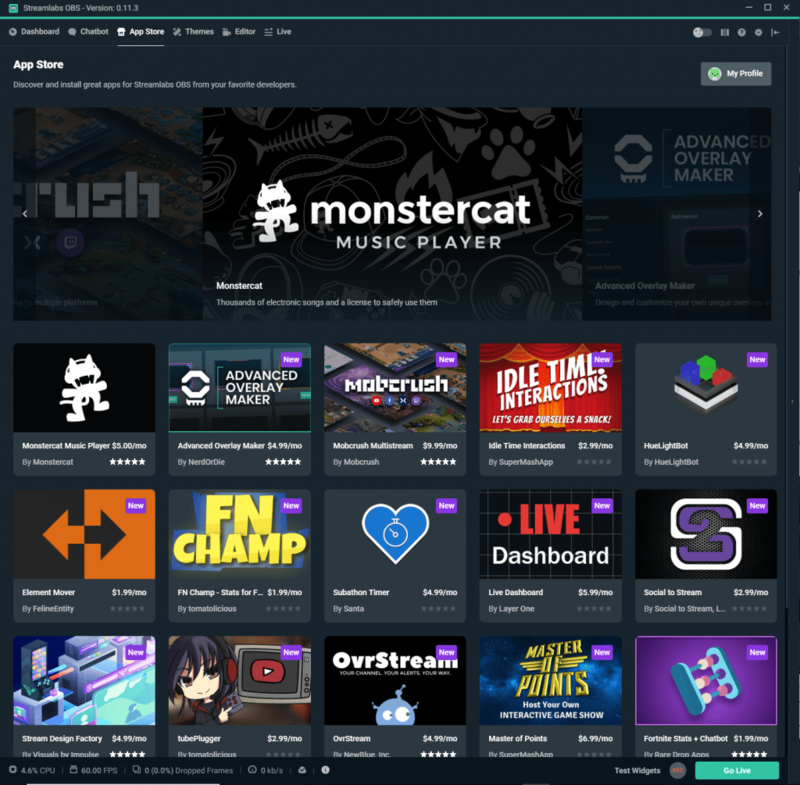 Layer One’s live Dashboard that details your stream in over 90 ways! Social to Stream, which allows media files to be shared by chat to the streamer in a safe environment. Layer One’s Subathon Timer, where you can host marathon streams and support can extend those streams. Visuals by Impulse’s Design Tools to help get that perfect look to your overlays. SuperMashApp’s quizzes and polls to add another layer of entertainment. SuperMashApp’s Game Show App, where you can live your dreams of being the next Bob Barker. 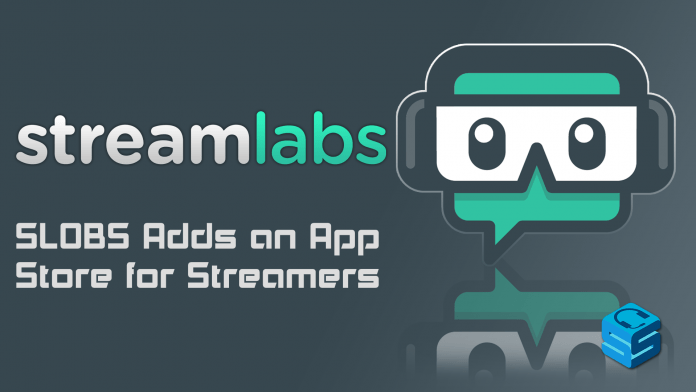 Mobcrush’s Sim-casting to help grow your audience. Tomatolicious’ live overlays for League of Legends and Fortnite. Tomatolicious’ live YouTube Feed, where you can have a rotating list of videos you’ve uploaded. Rare Drop’s Fortnite overlay builder and a chat bot to help announce stats. Rare Drop’s cross platform Chat program. Nerd or Die’s animated overlays and widgets, to add a moving source to the stream that isn’t you! Feline Entity’s keyboard shortcuts to easily move anything on your screen! 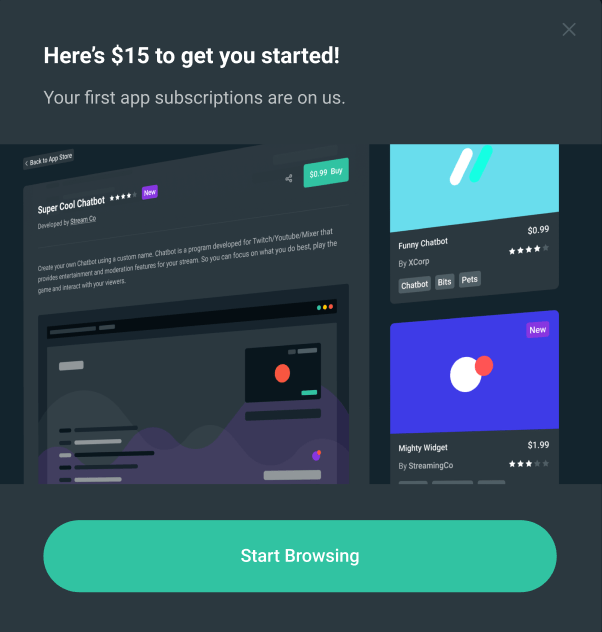 Earn $15 for app subscriptions by simply visiting the app store for the first time. So what are you waiting for? Go check it out in a SLOBS near you!